I have recently watched a fascinating programme called Kidult - which for UK readers is available on BBC I player. It is a documentary about a 4 year old, Marla Olmstead. She is the daughter of a painter and was allowed to paint freely with her equipment being set up by her father as a way of keeping her quite so he could paint. Her paintings were picked up by a gallery and she sold many for large sums. It seems that her run of luck ended when the press began to cast doubt on her ability. She was filmed painting and a 'expert' said that she was doing no more than pushing paint around like a child would do'. Collectors started to get worried and the phenomenon of her success apears to have ended. You can see many examples of her work here . The documentary raises many issues- including the obvious one about how appropriate it is for a four year old to be taken to her own gallery show in a limo with child seats in it! - but the one that caught my attention was the debate within the show about whether her art was 'good'. It raised the old question about the value of modern art. It is 'good' or is it a conjob? If a child can do it and adults pay for it does that make the adults fools or the child a prodigy? If a child can produce a piece of work that is indistingushable in quality from that of an adult artist does that mean that the adults work must be 'no good'. These are on the face of it interesting and ever debatable issues. But I beg to to raise a point: isn't it entirely the wrong question to ask - is this piece of art 'good' or 'bad'? Art is about beauty. How often have you ever heard anyone discuss whether a sunset is 'good' or bad' compared with last night's. I have on my wall at work prints of Gee's Bend quilts. It has often been said in the quilting work that these are 'bad quilts. It is true that they are uneven and crudely stitched in some cases. But when vistors to my room look at them they never realise they are quilts. They pronounce them 'fascinating' and 'beautiful' because they judge them from different criteria. They judge them from the emotion they get when seeing them and the fact that they are unlike anything they commonly see. So why do we feel the need to construct a framework in which something created as art is 'good' or 'bad'. I can see two answers - you may have more. The first is that those in the art / quilting worlds set up definitions of good/bad so that people can be ranked. 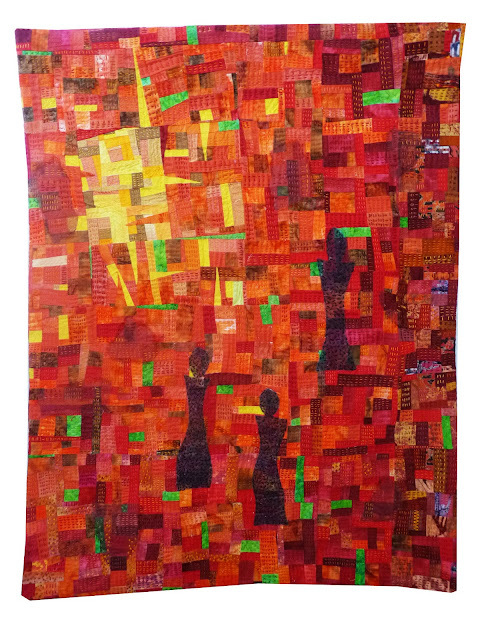 My quilt Mothers of the Orphans: Into the Light is in a show tomorrow. The term 'show' is actually a misnomer because it is not possible to enter this 'show' without entering a competition. It seems it is not enough for us to celebrate what people have created and faciltiate its viewing without adding the element of Judging to it. My quilt kept me happy for hours. It interested others in its making and it has received very positive comment on my website ( thank you all). I fully expect though that it will be returned with a little slip saying what is wrong with it because it does not conform to the traditional quilt making measures of what is 'good'. 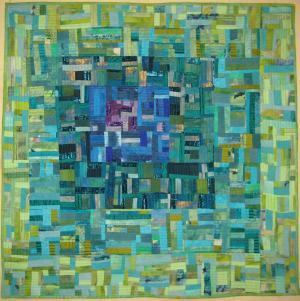 I am interested in why we see quilts as suitable for competition. I think jurying is a little different - there is a reason to curate a show to make it cohesive and to limit what can be fitted intoa venue. But to rank a quilt? Is that not a little like ranking whether an oak is more or less beautiful than a beech tree? It can only be done by reference to a set of pre-determined criteria that are actually unrelated to the emotional reactions to a work of art, because those emotional reactions are variable between indididuals and so cannot be measured for the purposes of a fair competition. Plus, art is to me about self-expression. How can you measure and therefore Judge that? The documentary showed the expert of Sixty Minutes who ended the Marla phonomenon by stating that Marla was just playing with her paint like a child and was not painting like an adult. A comparison was made elsewehere in the film with Jackson Pollcok, yet it was not said that he dripped paint about like a child. It was said that he 'invented an entirely new way of painting'. It seems to be that we have constructed an art world in which the furthest away we get from the free and jubilant play of self-expression we get the 'better' we judge the art. Is this because those who hold the power in the art world are fearful of being as free as a child and need to create boundaries which justify them not having to go there? The literature of Aboriginal Art is much the same. Dennis looks at Aboriginal Art and shrugs and says' I don't get it . Its just dots'. Of course only some Aboriginal Art comprises dots but I have been working hard to explain to him that - despite all the art talk guff going around about the art, there is in fact nothing to get. It is indeed just dots. Colourful, free, joyous, instinctive, beautiful - to the -eye -of-the-beholder ( or not depending entirely on personal taste) dots. Dots which express culture and stores and feelings. Anyone can do it. Especially people who have never worked with acrylics to whom you have just handed a canvas and some brushes and who does not yet have a hang up about whether their work is good or not. And thats all it needs to be. Unless you need to make a living out of being knowlegable about these things because you are not going to sustain a career out of merely explaining that dots can be beautiful. Which leads me to the the second reason which came out in the documentary for constructing this 'good'/ 'bad' dichotomy was - wait for it - yup, it's money. "I have always thought that modern art is somewhat of a scam. I have been a realist painter all my life and there are times it can take me nine months to do a painting. Then you read about auctions and the records set at Chirsties and Southerbys for these abstract paintings with swatches of paint like this and like that and they are selling for millions of dollars. You know the most I have ever sold a painting for was a hundred thousand dollars which is a lot of money, its an awful lot of money, but when you look at the amount of time I put into that painting compared with what some of these paintings are selling for. That I don't get. I just don't get because my kid could do that." Now I understand that opinion. To an extent. If you start from the premise that art is valued as a commodity by a fair hourly rate for production. But I have always doubted that it is reaslitic to seek to value art in that way or to make a living from it in that way. When we were in Germany we went to see an exhibition of Quilt Art 's wrk. My husband was taken aback at the prices they were asking. I explained that they had put a lot of hours into the work and were seeking to get an hourly rate back. As someone who could - more or less- deconstruct how the item had been made and calculate probable cost of materials, transport, marketing etc, the price was not unreasonable at all. But when we worked it out, the pieces were costing well in excess of the average UK workers wage for a month. Who can afford that? People who value art and who earn considerably more than that is the answer. And if those people are to spend large sum of money on art most ( I accept not all) will want it to be an investment. Either a monetary investment or an investment in their image - one that says look how cultured I am. Or how knowledgeable I am. Or how much taste I have. Or an investment in ther own happiness: what a beautful thing I brought into my life and how happy it makes me to see it each day. In none of those scenarios would you want the positive feelings to be taken away by a view that the picture is somehow tainted or less than it was billed to be. That you have wasted your money. And so, if you are going to pay good money for art that is done quickly with crude techniques there had better be something else about that art that gives it a status value. Much the same happened when Nelson Mandela began to paint. His art rocketed in value. It is very simple acrylics. Nothing very skilled. I am sure he didn't claim it to be - he was painting for recreation. But it sold very well. Why? Because it is by Nelson Mandela who is a truly remarkable man. So the value is not in the quality of the work. It is in the association with the man. ( This I can say for sure becuase I own some of the work for that very reason). And that means we have to start to evaluate what the qualties of the man are that gives the work such value. Which is nothing to do with the work being 'good' art. Nor about the time it took to paint. One piece is his handprint. You know - like kids do: hand in paint, hand on paper. Done. But when Mandela does it, the bit in his palm that naturally does not touch the paper - is the exact shape of Africa.. Now it must have taken all of ten minutes to do that and thats allowing for the time it took to remove the paint and design the piece. So on the gallery owners logic, about £20 quids worth. Plus a bit for materials transport and framing. But if valued on spine tingling factor and the owning of something actually touched by the man himself.- well its worth what someone will pay. So what I am saying - at some length I am afraid, - is that it is wrong to try to vaule art by an hourly rate mechanism. And I am afraid probably makes it unreaslitic to expect quilt art to make the makers the living their skills lead then to hope for unless they can sell with reference to an added value such as celebrity, or uniqueness or the invocation of an emotion that will inspire buyers to part with money to retain that reaction everytime they see the work in their own homes. And I am also saying that is is time to stop categorising art and quilts as 'good or 'bad' and start to examine them on the reactions they bring out in us. And to accept that the reaction caused by a painting on which nine months was spent may well be equal to one on which a child spent five hours daubing paint. Because joy can come from either method and that really is what art is about. Oh and time for those of us who do not make traditional based, perfectly stitched quilts, to desist from enetering shows becuase we will not win or we are not good enough yet. Lets take back our quilt shows and enter stuff aimed at spreading joy and creating interest and not only showing how we can do 15 handquiting stitches to the inch and a perfect binding. Ever wondered what I sound like in real life? Annie Smith interviewed Diane Hock and I at PIQF in October last year for her Quilting Stash podcast. I was very excited and then she lost the interview! It has now been rediscovered on her archives ( does that make us sound like the Beatles at all?) and you can listen to it here. And this is what we all looked like on the day - posing by a potted palm having broken into a banqueting suite to sit in the mostly dark to record the interview in quiet!